Lately, I’ve been a little fashion crazy. I’ve been devouring fashion blogs and I’ve spent hours upon hours searching for chic, eco-friendly clothing that would actually fit my changing body. I chalk some of it up to my weight loss journey, but I think a lot of it also has to do with feeling comfortable in my own skin. Since plus-sized, eco chic clothing is hard to come by, to say the least, I’ve become a big fan of consignment and thrift stores. I used to shop them primarily for home decor and furniture, but in the past year or so, I’ve started utilizing them for clothing as well. In addition to the green benefits of buying clothing secondhand, there’s also the wonderful fact that you can find lots of name brand pieces — some high end — for a fraction of the retail price. Last week, I made a stop at my favorite consignment store, Alexis Suitcase in Johns Creek, GA, and I wanted to share some of the awesomeness to be found there along with some tips for your own fashion thrifting adventures. The first thing that is immediately obvious about Alexis Suitcase is that it is very well organized. Unlike many consignment and thrift stores where you have to search through racks and racks of clothing to find anything that fits, these racks are separated by color and also organized by size. So if I’m looking for a white top in size XL, I immediately know where to look. Tip 1: Don’t make assumptions about sizes. The size labeling on the racks at Alexis Suitcase goes up to XL and 18, but in my experience it’s not uncommon to find sizes well beyond that. On different visits, I’ve found items up to 3x and 24. I’ve also found this to be true at other thrift and consignment stores. If you wear a particular size, chances are someone else in your area does too, and you’ll be surprised by what you can find if you just take the time to look. On top of that though, I’ve learned not to assume that items won’t fit. If I find something on the rack, hold it up to my body and it looks like it will fit, I will try it on even if the tag doesn’t show “my” size. I’ve found great pieces this way that I never would’ve tried if I were restricting myself to a specific size. I’ve found that skirts and dresses tend to be the most forgiving in terms of size. Great example? I found a J Crew skirt at Goodwill the other day in a medium (right now, I’m in a 1X or XXL), and it fit beautifully! Tip 2: Find out how sales work. 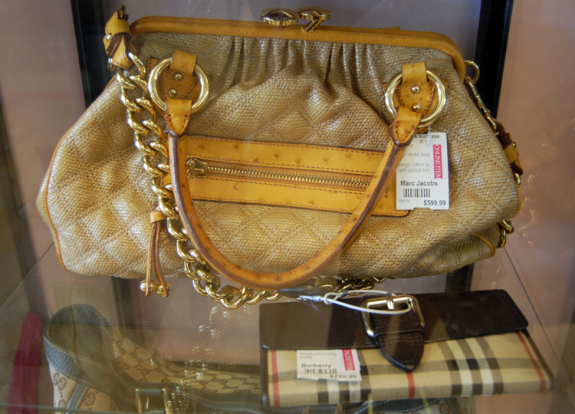 Many consignment stores also discount items that have been on the shelves a while. So after 30 days, it’s reduced by 15%, 30% after 60 days and so on. 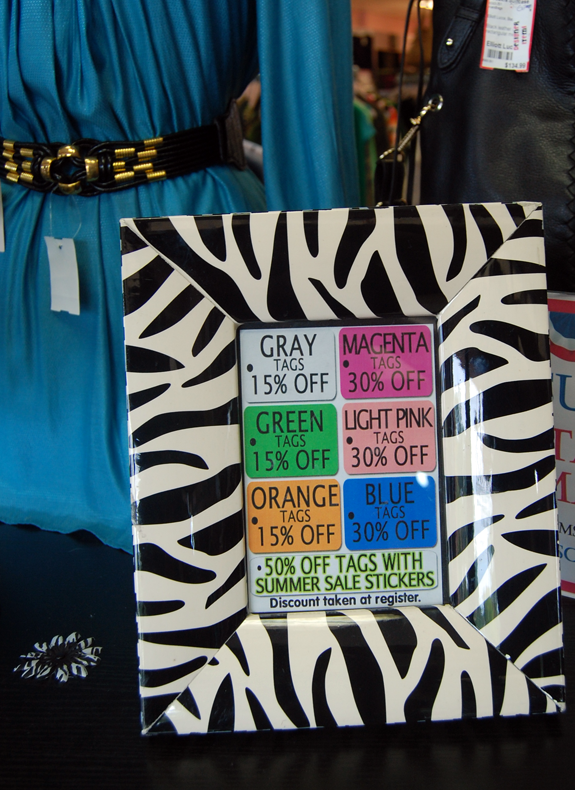 If there’s a store you shop often, just ask about their sale policies. I’m sure they’ll be happy to share if it means you’ll become a regular customer. Tip 3: Shop on weekdays. If you can help it and you’re ever available on weekdays, I’d suggest doing your shopping then. Consignment and thrift stores get new items every single day, but the pickings tend to be better during the week when there are fewer customers in store. If you do go on the weekends, try to go early and beat the crowds, particularly if its a sale day. 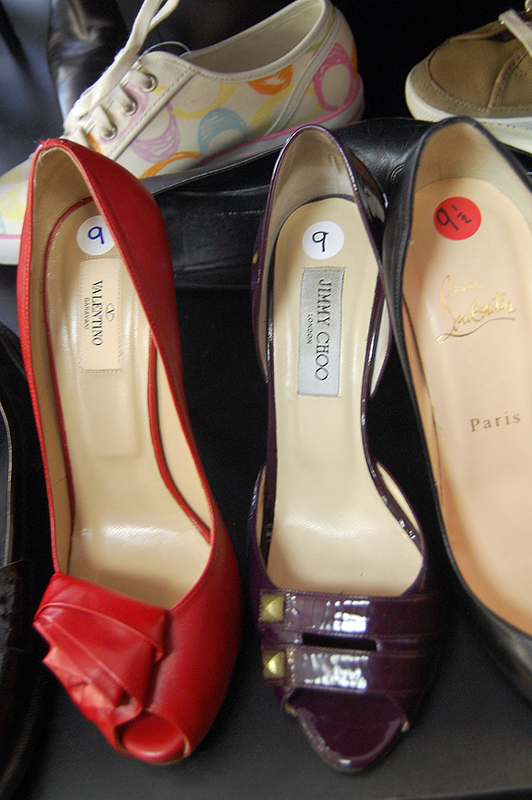 Shopping consignment and thrift stores can be a slow process. Admittedly, some stores make for faster shopping than others because they are well organized while others are not. But either way, you’ll have to take your time and look through the racks to find the really good stuff. Plus, there’s the fact that you’ll rarely find more than one of the same item. So if those shoes you love are too small, you’ll just have to keep looking until you find a pair that fits. Tip 5: Go with an open mind. Many people assume that the clothing you’ll find in thrift stores will be in terrible condition. Some of it is, to be sure, but there are gems to be found among the faded t-shirts and grandma’s house dresses. 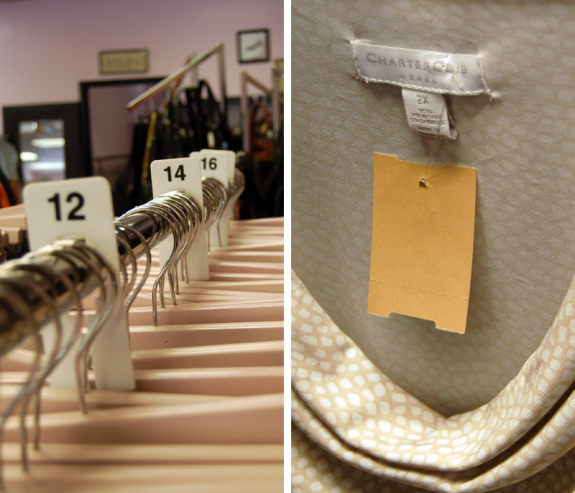 Plus, consignment stores offer a much better chance of scoring quality finds because each item is inspected and selected by hand before it ends up on a rack. So don’t assume. Just go in and take a look. Even if you don’t have visual examples in store, there are other ways to find inspiration. On Pinterest, create a pinboard of looks you like, then try finding thrifted pieces to recreate those looks. Or walk into the store with a single item in mind from your existing wardrobe: for example, a black pencil skirt. Try to find a number of tops, shoes, accessories, etc. that you could wear with that one skirt. I’ve been wanting a pair of TOMS wedges for years, and on my last visit to Alexis Suitcase, I not only found a pair of TOMS: They were actually my size! (aff) I scooped them up as soon as I realized they would fit! Even if you can’t find any clothes you like or in your size, you can almost always find shoes, purses and jewelry that will tickle your fancy, so don’t ignore those sections of the store. Need some examples? No problem! Tip 7: High End is Still High End. 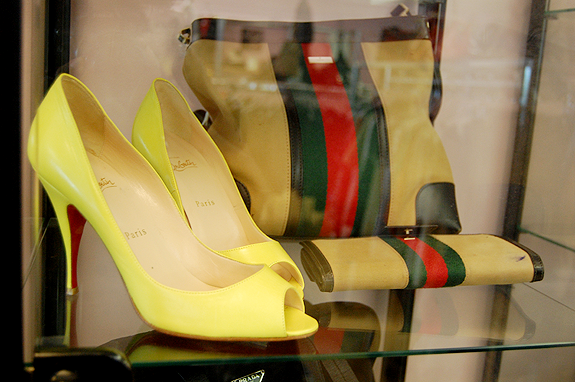 But even the smallest stores have become savvy enough to know which brands can justify a higher price tag, particularly when it comes to shoes and handbags. So if you do score a deal like that, shout to the rooftops, because you’ve found the needle in the haystack! What I’m saying is that while you’ll pay a fraction of the retail price for that pair of Christian Louboutin heels you have your eye on, that could still amount to a couple hundred dollars. Only you can decide if they’re worth the price to you. I personally love thrifting and consignment shopping. I walk in with a budget, and its usually not hard to stick to it. I always surprise myself by what I can get for relatively small amounts of money, and I feel good because I’m buying stuff that’s in its second life. So I can feel good about purchasing designer items that I either couldn’t afford or wouldn’t want to buy otherwise because they’re just not very sustainable. I really love Alexis Suitcase in particular because on top of their excellent selection of pre-loved fashion, their customer service is awesome! While you’re walking around the store picking up items, they will actually hold a fitting room for you, by name, and put your items in the room as you finish browsing so you don’t have to carry handfuls of items. At least 3-4 times a year, I go through my daughter’s closet to find items she’s outgrown so we can consign or donate what we’re not able to give away to friends or family. When we’re able to sell them, we make a little extra money, but even when we’re not, we love dropping off donations at local thrift stores so someone else can enjoy them and to help the causes of organizations like the Salvation Army and Goodwill. And now that I’m losing weight (17.5 lbs. and counting! ), I’ve been purging larger items from my own closet for consignment or donation. I have no intention of going back up to those sizes, so getting rid of them will help keep me motivated to keep moving toward smaller sizes 🙂 And as I move through the sizes, I’ll keep doing this. Shopping thrift and consignment is also a great way to get clothes in an in-between size without spending a lot of money if I know I won’t be wearing that size for long. 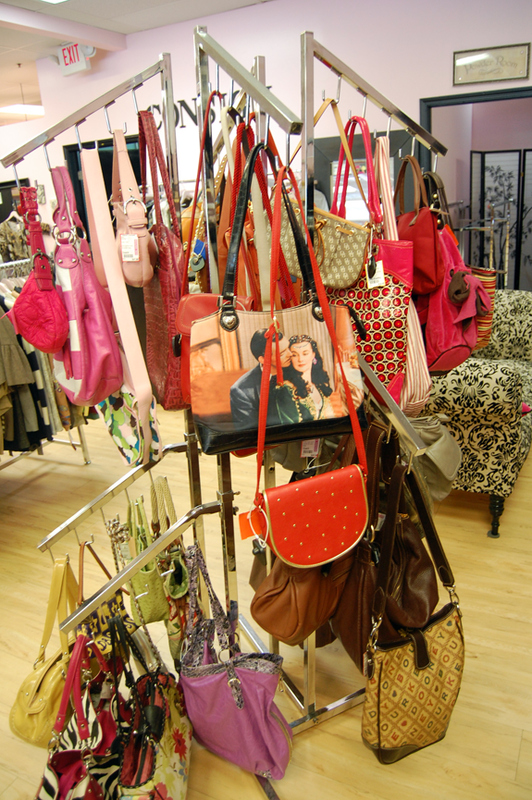 Do you ever shop consignment? What have been some of your favorite finds? Are there any important tips I missed? Share in the comments below and feel free to link to your thrift hauls if you have them online anywhere! Also, would you like it if I shared my own thrifting hauls here? Let me know! I love consignment and thrifting. Found some awesome deals at Value City last week. On Sept 4 I will be attending the Back by Popular Demand Consignment in Marietta where everything is $1. As you know living in the VI don’t have either. Do you know of any online thrifting stores? I haven’t bought any clothes lately and I’m trying to put things together from what I already have….some days are better than other. I would love to thrift, seem to get quality stuff at a great price. Awesome little tour! I have never been in a consignment store and I am so incredibly ready to go to one after reading this post! I don’t know whether they may be some where I live but I will definitely have to hunt one down. I love the idea of paying a fraction of the price for a highly sought after item. Thanks so much for sharing, especially the wonderful tips and advice! Next post: Boiled Plantain Recipe? Yes, Please! Previous post: #Cinchspiration Video Update & Cinch Starter Kit Giveaway!